Harry – Year 1 – for a fantastic detailed shield design and make. Grace – Year 1 – for a super, unique and accurately made shield. Jake – Year 2 – for independently writing a super fact file about giraffes, which was well organised and full of super vocabulary. Kayleigh – Year 4 – for a newfound fantastic attitude to learning, especially reading. 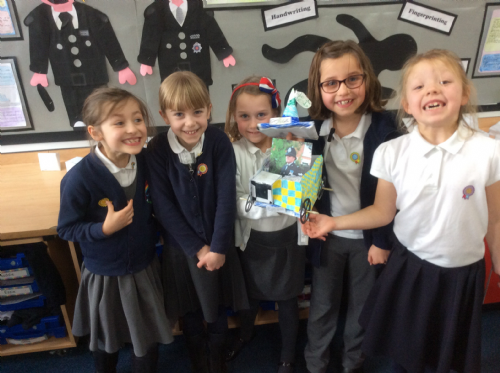 Millie, Holly, Leah, Essie and Lily – Year 3 – for incredible creativity and teamwork whilst making a model police car. WILF will be spending time with class 8 for 100% attendance this week and Jessica will be visiting classes 4 and 9 for both achieving 99.6%. Great percentages for this time of year and school being hit by so much illness. The Tidy Classroom Award, and winning the golden dustpan and brush, goes to class 10. Mrs Chambers has been extremely busy this week completing her final course of Ofsted training. On Wednesday, she completed her last inspection of the training and therefore we would like to congratulate her on becoming qualified as a Lead Inspector for Ofsted. School and children have missed her during her 16 days of intense training (since the end of November) and we will all be very happy to see her around much more after half term. Well, what a busy week in school with all children working hard towards their half-termly assessments. Following any assessments, we look at where the children are at currently and whether they are ‘on track’ for the end of the school year. At Parents’ evening, your child’s teacher will share with you the progress that they are making, and whether they feel that they will reach age-related expectations by the end of the year. Teachers will also share targets with you to help you engage in your child’s learning. Abigail – Year 1 – for designing the ‘key component’ and deciding what the dial will look like. Maisie – Year 2 – for creating a name for the weather station – ‘Beauvale Weather Watch’. Lola – Year 4 – for winning the ‘innovation’ award. Essie – Year 3 – for being the overall winner with a detailed design of what the Greasley Beauvale Weather Watch station will actually look like and how it will function. We cannot wait to see the weather stations being an added feature to the school grounds and designs being put into action. Very exciting! On Wednesday, we were sad to say goodbye and farewell to Mrs McDonald in year 3. She has worked at Greasley Beauvale now for a number of years, but felt it was time to move onto pastures new and teach closer to home. We thanked her for all of her hard work whilst working for us and for being such a commitment and fun member of the team. The children and staff were sad to see her leave but we wish her all the love, luck and happiness in her new job. Next half term, and for the remaining months of the school year, class 7 will continue to be taught my Mrs Carlton, and Mrs McDonald’s days will be replaced by Mrs Tantum. On Thursday, Mrs Tantum and I had a ‘scrum down’ about exciting SMSC opportunities for the rest of the year. SMSC is an invaluable part of our curriculum, which helps to widen children’s knowledge and understanding of the world (and wider communities) through social, moral, spiritual and cultural experiences. Their list includes parents and grandparents’ afternoons, school entertainment disco, vocational week, Apprentice week, British Values and cultural days, Easter eggs, sponsored events and Red Nose Day. All very exciting opportunities for the children to look forward to and definitely look out for more details over the next few weeks. Today, Mrs Chambers was very glad to be with us in true head teacher style. I think she was more excited about Gold Book than the children were. She loved seeing the police cars made by the year 3 children and even printed off photos of Glenn to put in them. She thoroughly enjoyed seeing many children for Head Teacher Awards and smiled all day. It was great to have her back and seeing her look so happy. Personally, my day also ended with a huge smile too watching the year 2 children performing their dances from ‘The Lion King’. The dances have been choreographed and rehearsed over several weeks and I was delighted to be invited to watch (alongside Mrs Chambers, others teachers around school and so many happy parents). The children were brilliantly delightful! They wore stunning animal headdresses, and led the parents off in true Greasley style to their classrooms to share their animal fact files and carefully created puppets. What a fabulous way to end the week. Following a very busy, wet and cold half term, we hope that you all have a super week with your family and enjoy the rest. Because of this, there will be minimal (or no) homework this half term. Happy Holidays and we very much look forward to seeing all the children back in school on Tuesday 21stFebruary following the INSET day on the Monday.